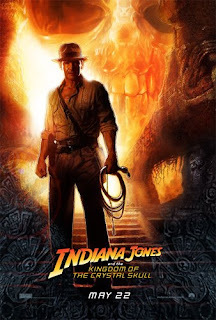 Indiana Jones and the Kingdom of the Crystal Skull stars Harrison Ford as Indiana Jones, Cate Blanchett as Irina Spalko (Russian military lady), Shia LaBeouf as Mutt Williams (Indy's son/sidekick) and Karen Allen as Marion Ravenwood (Indy's old flame). Directed by Steven Spielberg, produced by George Lucas. This most recent installment of Indiana Jones wasn't the worst one ever... it was only the second worst. I don't think they could make The Temple of Doom worse even if they tried. Aside from its unoriginal storyline and a terrible script, the Kingdom of the Crystal Skull lacks one of the most basic things that makes Indiana Jones interesting: An artifact that we care about. There was nothing sacred about the crystal skull... why should we care if it falls into the wrong hands? Oh, right, because it might make a really bad weapon... blah, blah, blah. The Raiders of the Lost Ark and The Last Crusade are also superior to the other two Indiana Jones installments because they are based on real, recorded history. The Tanakh (Christian Old Testament) has preserved a huge portion of ancient Israel's history, much of which centered around the Ark of the Covenant. That there might be a Holy Grail with special powers is a bit fanciful (indeed even contrary to the practical spirituality that Christ advocates), but at least we know that Jesus had to drink out of something, right? In The Last Crusade Sean Connery (Indiana's father) made a point of explaining to Indy (and therefore also to us, the audience) what their motivation should be: "The quest for the Grail is not archeology, it's a race against evil. If it is captured by the Nazis the armies of darkness will march all over the face of the earth." Such statements helped clench the validity and the credibility of Jones' missions in The Last Crusade as well as The Raiders of the Lost Ark. hmm, yes that is a good point, Spielberg does like aliens doesn't he? Never mind; you always have Indy 5 and Indy 6 to look forward to; the scripts may get better! I guess I should not regret missing to watch this movie. I really like Indy movies and was curious to know if I'll love or hate this new Indy film. I guess judging the movie based on your review, Harrison Ford became a piece of relic. :D Btw, I like your blog, I am a big movie fan too. I will watch "The Hulk" this weekend. Hope it gets 4 stars from me. I agree with you about the movie being the second worst! I also agree with you about the skulls being the worst part of the movie, it doesen't even fit in the movie! I'm not sure I agree about not "caring" about the skull. We only "cared" about the Ark of the Covenant and the Holy Grail because we already knew what they were. There are numerous valid reasons why Spielberg built to the fact of the skull's origin. What I didn't like about KotCS was the same thing I didn't like about ToD: there was too much of the "sorcery" in this one. RotLA and TLC saved instances like that for the end where the miracle really seems necessary, and to show that putting reigns on said miracles had dire consequences. Frankly, I'm glad Spielberg chose not to use a Judeo-Christian religious relic; in as much as I revere them, pop culture has exploited them enough. I'm looking at you, DaVinci Code. But all Indy Jones films had similar themes: there's an artifact that other archaeologists with questionable motives are trying to find and control for their respective groups of historically-based antagonists. So Indy must stop them by beating them to their own game.